Play On: Virginia Tech Hokies +3. Well you have one thing going for you if you are backing VT in this game, Bud Fosters defense. 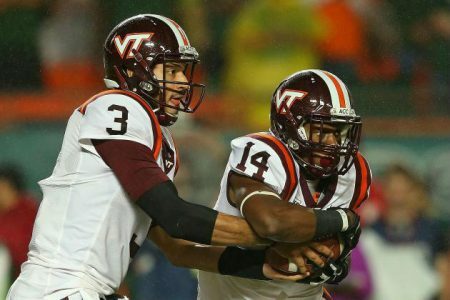 The mystic has worn off of Hokies as both father time has caught up with Frank Beamer and the offense is outdated and depleted in talent for VT versus past years editions. They had to win their last game of the season to become bowl eligible and their only 2 wins this season that mattered in terms of national attention was an early season win at Ohio State and a 1 point win at Duke late in the season. What sticks out is a 6-3 loss at Wake Forest, just inexcusable for a program like VT. How things have changed in Blacksburg. The Bearcats roll in here with huge momentum with 7 straight wins (6-0-1 ATS) to end the season, a co-conference title, and an offense led by Notre Dame transfer Gunner Kiel who is a dual threat and makes Cincy go. Momentum HOWEVER IS NOT ON THE SIDE OF ANY BOWL TEAM. Too much time has passed. The easy route to lay the measly 3 points with a high octane offense and go against an average VT team here which EXACTLY Why I am taking VT in this game. Frank Beamer and Bud Foster have 4 weeks to prepare basically for a team who played in a very weak conference and the wins over bowl bound Duke, and Final 4 contender Ohio State tells me VT can win this game and Beamer can still get his boys up for a big game. Cincy has not seen a defense like this one gents, that is the difference. Free Pro Pick on Virginia Tech. Bowl Package $110 – Plays daily in the Bowls and a hot in the NCAA! Cash out with a 22 year veteran capper.